where to have open streets in Sacramento? Sacramento Area Bicycle Advocates (SABA) posted a question on Facebook, “Where shall we hold one in Sacramento?” about the Sunday Streets event this past Sunday on the Embarcadero in San Francisco. This echoes a conversation Alexis and I had while we were attending. She liked the Embarcadero Sunday Streets because it was a long distance and showed how streets can be used for transportation in a different way than we usually use them. For Sacramento, that would argue for a long distance closure that connects together destinations. Though I certainly enjoyed this Sunday Street, I really like the two that I’ve been to in the Mission neighborhood of San Francisco, which close stretches of Valencia St and 24th St. This route is in a neighborhood, there are people living along the streets and in the neighborhood, as well as those who come from other places to enjoy. There are a multitude of locally-owned businesses to appreciate and engage, with nary a chain in sight. The special events such as play areas, climbing walls, hula hoops, dance demonstrations and others feel more concentrated rather than scattered out along a long route. For Sacramento, this argues for a midtown location, which is the only area where there is a sufficient concentration of residents and locally owned businesses. The Mission event is about community, and more like a street fair. Embarcadero is more about transportation, and Mission is more about community. Sacramento, of course, could do both. For more information about the flavors and locations of open streets events, see Open Streets Project. Check out the website for background information including “models”, and then go to one! Of course San Francisco is the easiest for us here in the Sacramento region, but Berkeley will also be having one or more this year, and as you’ll see, they are becoming common on the west coast, throughout the United States, and the world. The next San Francisco event is on April 14, and is in the Mission neighborhood which I’ve referred to above, on Valencia St and 24th St. Don’t miss it! And bring back your thoughts and commitment to making it happen in Sacramento. Alexis and I volunteered at the event as intersection monitors. Once you’ve been to an event, you can consider volunteering, which provides a different perspective. Though I was initially assigned to an quiet intersection where there was nothing much to do, I got moved to a lively intersection, The Embarcadero and North Point, where the F streetcar line crosses The Embarcadero at an angle, and there was a lot to do, stopping the walking-biking-rolling crowd as the streetcar came through, keeping people out of the dedicated streetcar lane, and talking to people about how to safely cross tracks. 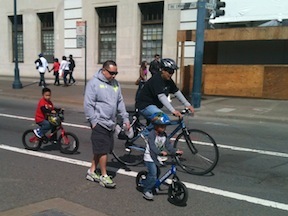 I wrote more about the Sunday Streets Mission events I attended last year. Which was the two interesting at the same time as insightful!